I really enjoy Vampire Weekend’s eponymous first album; actually, my hubby and the baby do too. I am partial to African instruments and rhythms, and VW uses both, even though they come from New York. Their songs (to me) are celebratory, unusual, great to get up and dance to, but also work well as background music while playing Settlers of Catan. The lead singer, Ezra Koenig, seems to be able to go anywhere with his voice, while at the same time sounding unpretentious and almost down-homey. They also score high on the McClure Lyric Rating System, devised by a brilliant friend of mine and her brother, wherein you give a point for every word they used that you have rarely heard in a song, and two points for every word that you have never heard in a song, and you take away a point for every time you hear “yeah” or “baby”. VW has seriously interesting lyrics. In their first album, they talk about things like mansard roofs and oxford commas, and include such fascinating phrases as “coronation rickshaw grab” (it’s like they know about the McClure system! Wow! ), “a devastating backstroke”, “cut his teeth on turquoise harmonicas”, “spilled kefir on your keffiyah”, and “your collegiate grief has left you dowdy in sweatshirts”. Great stuff! 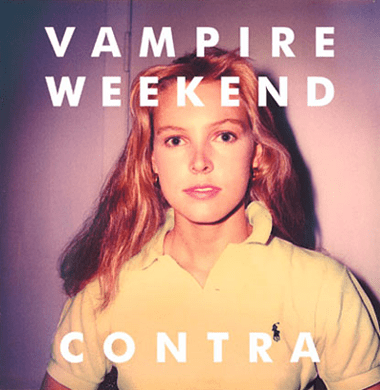 The new album, Contra, is similarly endowed with interesting words and phrases, but VW proves they can combine them with simple words to create unique moments. As in, “When I was 17/I had wrists like steel/and I felt complete// and now my body fades/behind a brass charade/and I’m obsolete.” Or how about “A t-shirt so lovely it turned all the history books grey.” Cool shizzle. I don’t pretend to know what it means, I just dig it. Both albums cause this reaction in me: “Oh, this song’s my favourite. No wait. This song is my favourite, for sure. Ooh, but this song!…” etc. Both albums are, as I say, fun to dance to, or Jolly Jumper to, if you prefer. However, Contra is superior for me for the following reason: unlike the self-titled album, it does not have two songs containing the f-bomb. Being a teacher and a mom, I never fail to wince at this – even if it’s appropriate in the song. If I had to pick my favourite songs… well, “Horchata” is a super-catchy. “White Sky” has great vocal acrobatics interspersed with a tinkly awesomeness that channels Paul Simon. Same with “Diplomat’s Son”, but with heart-squeezing violins and a reggae groove – shouldn’t work but does! “Holiday” just makes ya feel happy. “Run” has exuberant synth brass. And the last track, “I Think Ur a Contra” has this incredible sweetness and sadness with the bonging of oldey-timey piano and a wandering melody that makes you, too, have a feeling you could tell each other everything for two months. And there are only ten tracks on the album. And the others are good too.